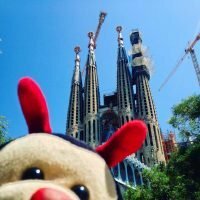 Travel Bug’s first of his fascinating facts about Barcelona concerns the jaw-dropping Barcelona Cathedral. It is one of very few building to earn a UNESCO World Heritage site status despite not even being finished yet! Sagrada Familia was the vision of world-renowned Spanish architect, Antoni Gaudi. It has, to date, taken longer to construct than the Great Pyramids at Giza. Before hosting the Summer Olympics in 1992, there were no beaches in Barcelona. These days, that seems a little bit odd, considering they have a ton of them. Before the games, the coastline was just jaggy rock (ouch!). Travel Bug doesn’t much like the beach because he gets sand in his shell. He’s very pleased for all the Barcelona humans. Not only have they created beaches, but the city is also now considered to have some of the best in Europe. Barcelona is home to Europe’s one and only museum dedicated to funeral carriages. Travel Bug doesn’t quite understand this because, when bugs die, they don’t get any kind of procession down the street. Do you have any other fascinating facts about Barcelona to share with the Travel Bug?